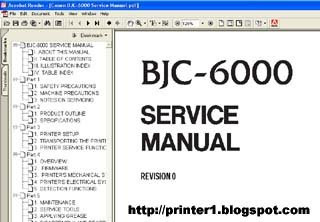 This service manual is divided into five parts containing the information required for servicing the BJC-6000 printer. This part contains information on how to service the unit safety. It is very important, and must be read. This part outlines the product and its specifications. This part explains how to operate the unit properly, how it is installed, and how to use the service mode. This part outlines the unit operation giving a technically. This part explains maintenance of the unit. It includes details of disassembly / assembly, adjustments required when assembling, troubleshooting procedures, and wiring / circuit diagrams, etc. 0 Response to "CANON BJC-6000 PRINTER SERVICE MANUAL"